You know, as the current manifestation of a website, I really have to think that the Human System of Counting is ineffective. Yes. Binary is the way to go. Yes. It’s a different way of representing numbers. Here’s an overview of binary. Ok… So why do you think it’s so much more effective? Well, I should rephrase. It’s more effective for some things. If we were actually writing stuff out on paper, it would be much less effective. But in terms of basic representations of counting, it could be a lot more effective. Well, I’ve been thinking about counting. And learning to count. And fingers. You’re talking about counting on your fingers? Right now, as I’ve said, it’s horribly inefficient. Each finger you hold up counts as one digit, and you count up the number of digits, so the maximum you can get is 10. 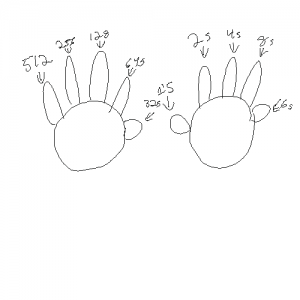 Unless you’re using a unique base-10 system, where the left hand represents 1s, and the right hand represents 10s, in which case you can get up as high as 99. …Uh, ok! I’ll take your word for it. Good. It’s not really important. 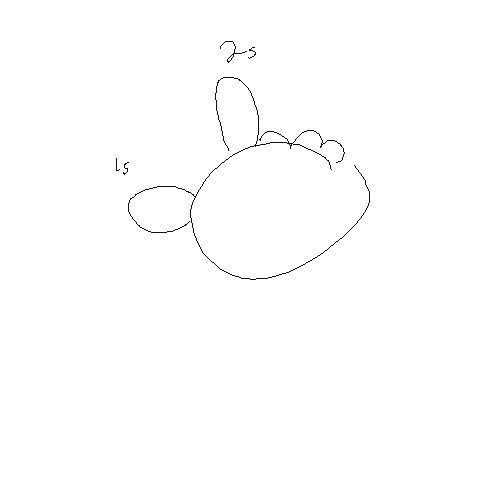 Anyways, as I was mentioning, I was thinking about how inefficiently we use our finger-counting system. If we were to count our fingers in base 2, we could get a whole lot more. Isn’t base 2 a lot less effective? On paper, yes. 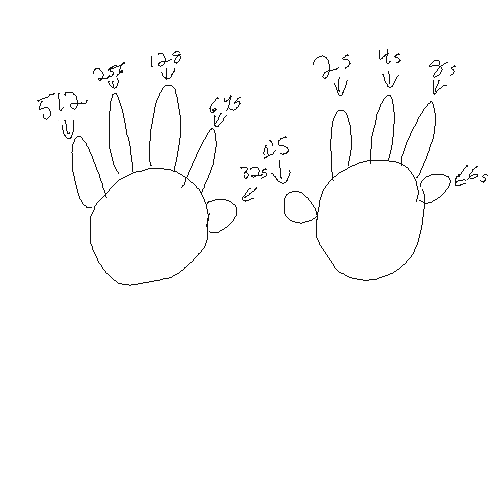 But in terms of fingers, you could get up to (2^10)-1. Just with your 10 fingers. Simple, really. 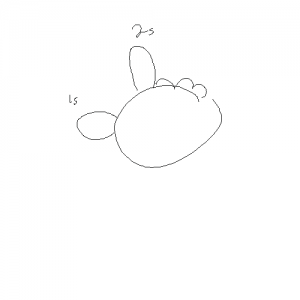 Make each finger represent a power of 2. After that, it’s all a matter of simple memorization, and then addition. And memorizing how to count. You see, if you have a particular base’s finger up, you count that base. If it’s down, you ignore it. Three, for example, would just be your thumb and first finger up. How to count to three in binary with your fingers. Anyways, I really think that binary has so many applications we haven’t even thought of. And I really think that everyone should relearn how to count with their fingers. Thoughts? This entry was posted in fluffy, pointless, real world, The Maths! on February 28, 2013 by Fluffy McGiggles. As I write this post, it is a dark and stormy night. The wind is howling in the leaves, and (Lord willing) I will NEVER AGAIN NEED TO EXIT THE CAFETERIA INTO A HAILSTORM. Seriously. That was an absolute nuisance. And I GOT ICE IN MY HAIR. And it melted before I got a chance to see it! Isn’t that a little dramatic for you, Webmaster? I’ll blame it on the weather. But anyways, that is a marvelous segue. One of my favorite forms of procrastination is looking at amusing websites. One that I absolutely love visiting annually is the Bulwer-Lytton Bad Opening Sentence contest. You admire people who can write badly? That explains so much! Anyways, the contest is in “honor” of Bulwer-Lytton, the infamous author who first published a book with an opening sentence that contained the phrase “It was a dark and stormy night”. This is definitely one of my favorite re-read websites. The sentences are so delightfully badly written! And actually, some of them look like they’d be the start of some very amusing books. If you’re bored, or looking for a laugh, I highly recommend checking out the winners. This entry was posted in real world, Webmaster, writing on February 27, 2013 by Webmaster. 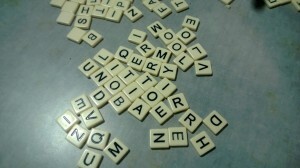 A friend of mine has introduced me to a game: “Bananagrams”. It’s a rather fun game, and somewhat similar to scrabble. Another name for it is actually “Speed Scrabble.” Basically, all the tiles from scrabble go into the middle of the table (face-down), and there isn’t a board. Each player then starts off with some number of tiles (twelve in our version.) 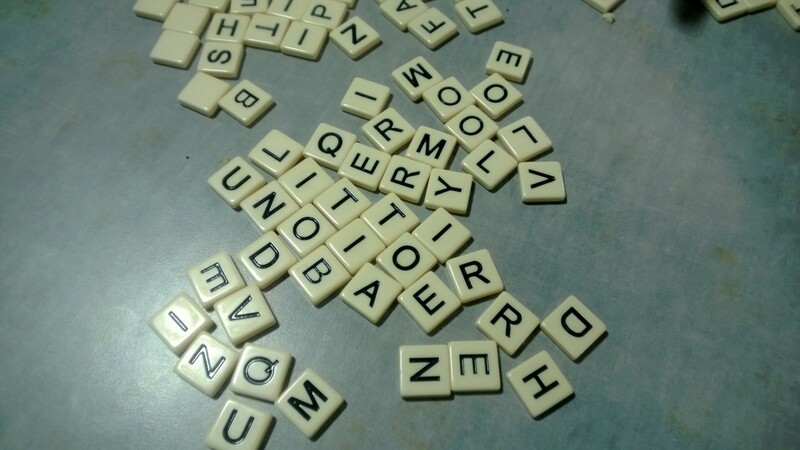 Then each person tries to use their tiles to come up with as many connected words as possible. (Basically, imagine that you have your own small scrabble board in front of you.) More to the point, each person tries to use all their tiles. If someone does so, s/he shouts “peel”, and everyone takes a new tile. Let me guess: Part of the purpose is to be as loud and obnoxious as possible when telling everyone to get a new tile? How on Earth did you guess? Alright, so it depends on who all is playing. There are some people who are so fast, they don’t have time to yell. Seriously. It’s like they’re just saying “Peelpeelpeelpeel…” over and over again. Those people are annoying. Since you’re clearly not one of them, I’m not surprised. How could you tell I’m not one of them? You’re primarily writing this blog post in a monosyllabic vocabulary. With an occasional polysyllabic word to break up the monotony. Yeah, I’m not the best. But I have come up with a way to work against those wordier folks, though! Yes. First, a bit more background. The game also lets you trade out tiles. You can put one of your tiles in the pile, and then take two more random tiles. Now, you can also put your discard tiles anywhere you choose. Also, you see, if someone calls “peel”, the players sometimes don’t look at where they take the tile from. That makes it easier to damage other players’ tile selection. That way, if you get a harder to use word (like “Q”) you can put it in the area where the best choose from most often. That will sometimes slow them down, and may allow other players to catch up. Even if that strategy doesn’t keep them from winning, it still can add laughter into the mix. Anywho, I’ve found it to be a game that I surprisingly enjoy! I highly recommend trying it some time. This entry was posted in procrastinate, real world, Webmaster on February 26, 2013 by Webmaster. Just last summer, I was in a Crown Books Store, and I came across a fantastic gem of a book. And decided that it was well worth the $8 the book store was asking for. Seriously, one look at the cover and I was sold. I know that they say “don’t judge a book by its cover”, but seriously? That cover just about says it all. 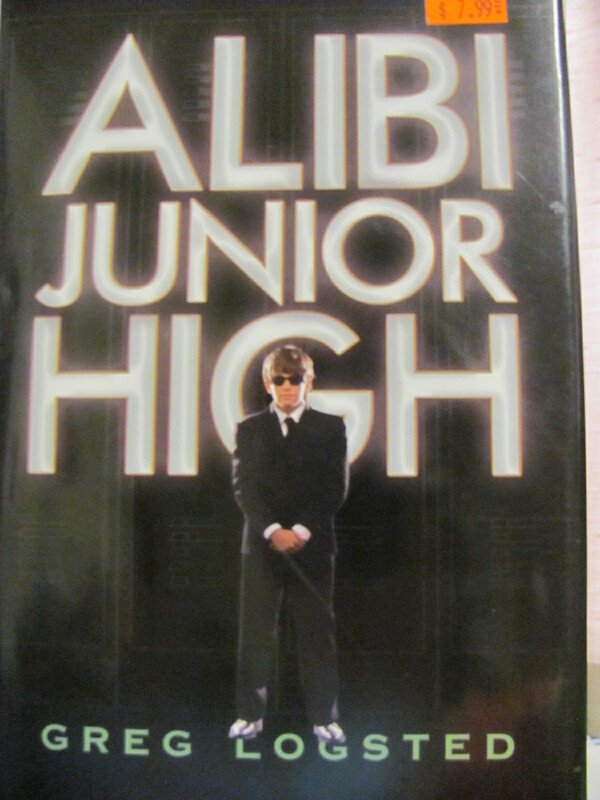 “Alibi Junior High”, with a picture of a kid dressed like what Americans assume spies look like? Priceless. Just to confirm that it would be as ridiculous as it appeared on the outside, I did start to read it. And oh my word. It was so unintentionally hilarious. The first sentence: “I hate airports.” Yes. It was first person. And clearly trying to be dramatic. On the next page, while still describing airports, and this (presumably spy) is going through the airport checking for potential threats, the phrase “It’s one huge, emotional paper shredder” appeared. How can you say “no” to a book like that? We discover that Cody, the main character of the book, is a thirteen year old boy who has been living with his father, and participating in clandestine operations all over the world. And, as he tells his aunt who he ends up living with due to odd circumstances, his “English and math skills are on a college level”, he speaks five different languages, has two black belts, has been to “every corner of the globe”, and he’s been in “more dangerous situations in any given month than most [Junior Highers] have been in their whole lives.” And now this kid is trying to go to Junior High, and trying to fit in, in order to stay undercover while his dad takes care of something. Needless to say, it goes painfully on from there. This boy is “perfect”, except for knowing how to fit in. He knows more than his teachers about all of his subjects (it seems), he’s able to out-sneak a special-ops military man who’s home after being wounded, ends up sorting out the PE Coach’s bullying problem, starts a martial-arts / defense club, gets kidnapped (of course) and then manages to save the day. Oh, and he starts wearing fancy, expensive suits to school (while trying to stay undercover) because it’s what he’s accustomed to wearing. 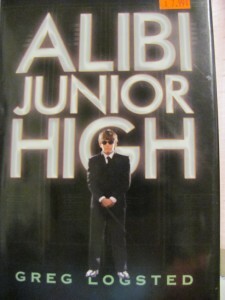 If you’re looking for a laugh, melodrama, and totally unbelievable fluff, I highly recommend Alibi Junior High. Especially if you can get it at a major discount. This entry was posted in Book Review, real world, Webmaster on February 25, 2013 by Webmaster. I have recently discovered something about your world: Some people think your world’s police dogs are very intelligent. How do I know this, you ask? Well, good question! I mention this because one judge in your world had a dog write a witness report. Granted, the police officers needed to fill out the report for the dog, but that is moderately irrelevant. Your judges must think very highly of police dogs, and that is what truly matters. So, your police dogs must be very smart. This entry was posted in Uncategorized on February 24, 2013 by Fluffy McGiggles. Hello, readers! I hope you’re having a wonderful weekend. However, since it is a weekend, you might be feeling a bit bored. Not to worry! I have the solution! You can do some baking. But not just any baking; how about following the United States’ military 26-page recipe for brownies? From what I can tell, this recipe originated for one or more of several reasons. The first is that the bureaucracy in America has taken over the world. The second is that the U.S. soldiers deserve the most time spent on their desserts. Of course, that does not mean the recipe must taste very good. Indeed, the dessert was designed to last, not necessarily to taste phenomenal. Still, it’s definitely amusing seeing all the stipulations that get thrown into the recipe! If you do actually make them, let me know? This entry was posted in cooking, fluffy, pointless, procrastinate, real world on February 23, 2013 by admin. This morning, I had an “experience” with my alarm clock. You see, today my alarm clock music was “Dubinushka” by Rimsky-Korsakov. (One of my favorite composers.) It’s a nice piece, and ends with a lot of energy. Seriously, if there’s one thing Russian Music does well, it’s “Loud and Obnoxious to the extreme.” So needless to say, I normally don’t sleep through it. In the end, after about three minutes, I finally really woke up and realized that my phone wasn’t actually broken. That made me a lot happier with my alarm clock than I had been in my dream. This entry was posted in Uncategorized on February 22, 2013 by Webmaster. How do YOU feel about Muffin Flavored Shrimp? Webmaster, what is with that title? It’s descriptive of what I’m going to be talking about, of course! I thought that it had been too long since I went around terrorizing asking people I know random questions, so I decided the situation must be rectified. That was also helped, of course, by the fact that a perfect, totally random question came to me. Bwah? What does that even MEAN? Well, working backwards: Exsanguinated means being completely drained of blood. To defenestrate someone is to throw them out of a window. And then I’m not entirely sure what shrimp “of the paintball variety” would be, but muffin-flavored shrimp would be odd. Who paid you to ask me this? Ah, those poor unfortunates. Their situation is truly discouraging; they really need representation, and a voice amongst the people! No. I’ve seen the kind of muffins you eat. I think someone needs psychoanalytical counseling. 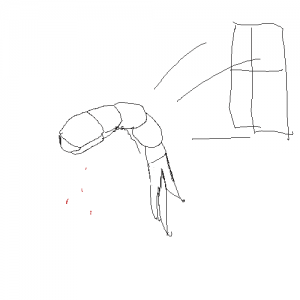 Why were the shrimp defenestrated? I mean, everything else makes sense, but why would you throw them out the window? Well, I’m not particularly fond of shrimp. But I do like muffins, and I’m always in favor of defenestration and exsanguination. So on the whole, I’d say I have a positive reaction. 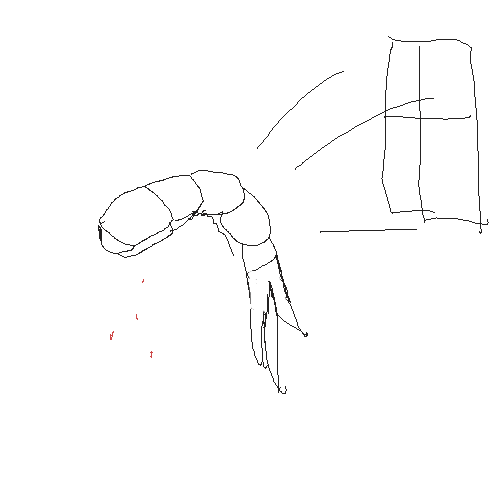 Why are you a) draining the shrimp of blood, b) throwing them out a window? and c) WHAT THE BLOODY  DID YOU PUT IN YOUR ORANGE JUICE? I think that it’s a gross violation of shrimp’s rights. Freezing them and eating them is one thing, but this is something else entirely. I think that we should take a stand against this! It’s good that they’ve been drained of blood first. If I knew what they were, I’m sure I’d be for it. No. Just no. Muffins are supposed to be lightly textured and sweet. Shrimp are supposed to be meaty and salty. You can’t do that. It’s like… like ketchup and ice cream. I don’t know, but they definitely would not be accepted by a finite state automata. As long as there are enough teeth, I’m interested. at this point, they are inedible because they have been thrown on the ground. I’m not sure. I’m not a fan of shrimp to begin with, so the muffin flavor wouldn’t help. Oh, look at the length! I guess that muffins will need to wait until another post. Anyways, dear readers, what is your response to this question? This entry was posted in ANIMALS!, pointless, real world, Webmaster on February 21, 2013 by Webmaster. I know that I’m new to this world. But seriously, after finding out about the ostentatious wastes of money that exist, I thought I’d seen it all. WHY IN THE WORLD DO YOU PEOPLE BUY AND SELL ITEMS LIKE “BANANA SLICERS” FOR 10 BUCKS? Banana slicers. You heard me. Designed to make perfectly even banana slices. Because knives are too dangerous for this fruit. Ten Dollars. Oh, sorry Fluffy. Um, you see, most of those reviews are written very tongue-in-cheek, and are definitely worth a read. Don’t worry, our world isn’t actually full of people who care too much about perfectly sliced bananas. So, those reviews aren’t serious? Your world doesn’t actually care about perfectly sliced bananas? How can you not CARE? They’re bananas! They’re designed as a mental challenge: How can you perfectly slice them, to the optimal thickness! And… you don’t care! Nothing. I was just staying in practice for if I ever go back to acting. But seriously. Knowing that those are tongue in cheek helps a bit. But who comes up with a banana slicer in the first place? People on too much sugar and caffeine? Anyways, readers, have a great day! This entry was posted in fluffy, money, pointless, procrastinate, real world on February 20, 2013 by Fluffy McGiggles. Congratulations! You have introduced an “Earbug”! You see, I remember tunes. But frequently not words. And very frequently, not entire sets of tunes/words. Furthermore, my friends often like music that I normally wouldn’t listen to. And unfortunately, their music gets stuck in my head not infrequently. And IT WON’T COME OUT. A different friend of mine refers to those pieces as “earbugs.” And they couldn’t be better named, from my perspective. It’s something somewhat in your ear, and it won’t come out. Oh, the tragedy. My heart bleeds for you. Wow, you actually care about me? I actually find that quite amusing. Yeah, I guess there are worse problems to have. Ooh, there are medals for annoying you? Well, I guess I’ll need to fix that! Congratulations! You “Introduced an Earbug”. 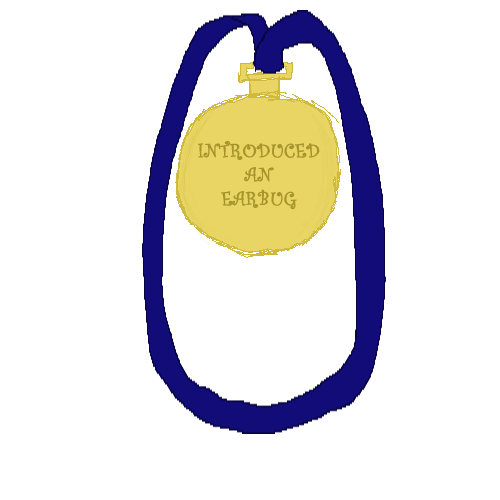 So, readers, if anyone introduces an earbug to you, you can now just copy a picture of this medal, and send it to that person. Voila, instant medal! I’m not sure whether you’re evil, or a genius. Or none of the above. All of the above. I’m an actress, remember? This entry was posted in pointless, real world, Webmaster on February 19, 2013 by Webmaster.